REAL ESTATE-Brick and vinyl home with a family room, living room, kitchen w/breakfast area, utility room, and dining room. Home has 2 bedrooms each with their own master bathroom, and hallway bath. The basement is partially finished w/living quarters. Pull your car into one of the 3 bays of the garage from your paved drive. Home has White House water, natural gas, and a home generator. There is plenty of room to roam and enjoy the outdoors on 5 acres. 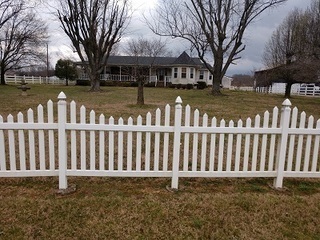 The land around the house is surrounded with white vinyl fencing. This home has been well maintained and offers an excellent location to Gallatin, Portland, White House, and I-65. -Building lot-1.27 +/- acres with a 36×54 tobacco barn w/shed, 122′ of road frontage, perked for a 3 bedroom home. PERSONAL PROPERTY-4 pc 4-poster pineapple bedroom suite, bedroom suite, dresser w/mirror, marble-top bedside table w/claw feet, bowl and pitcher, drop-leaf table, Japanese vases, blue vases w/crystal teardrops, rose bowl, walnut marble-top side board w/mirror, cherry secretary w/9 drawers, marble-top dresser w/walnut inlay, oak marble-top dresser w/mirror, Japan covered bowl, recliners, sofa, end tables, floor lamp w/brass bottom, miniature kerosene lamps, floor cabinet w/glass doors, Gone With the Wind lamps w/angel cherubs, 6 cups and tea ladle, oriental umbrella holder, gilded frame mirror, microwaves, misc. dishes, bar stools, dining room table w/4 chairs, single-door fridge, double-door refrigerator, Hotpoint chest freezer, 4 person Four Wind Spas hot tub, porch swing, metal glider w/2 chairs, glass-top table w/ 4 chairs, cast iron love seat and chairs, wrought iron chairs, electric outdoor fire pit, gas grill, pool supplies and pool floats, exercise equipment, Ashley wood burning stove, DVDs, dinner bell USA #2, Craftsman roll-around tool box, hand tools, gas leaf blower, gas weedeater, electric hedge trimmer, craftsman table saw, shovels, racks, hoes, corn scoops, Troybilt 8.5/2800 psi pressure washer (like new), Ryobi radial saw, Werner 6′ and 8′ step ladders, Werner 24′ extension ladder, Schumacher battery charger, milk cans , water pumps, portable air tank, 8″ bench grinder, Fairbanks platform scale, tobacco boxes and air press, Sandborne Magna-Force 6.5HP 60 gallon air compressor, seeder and dimpler for tobacco, and more. PERSONAL PROPERTY-Cash, check, credit card day of sale. Credit cards will be charged a 3% convenience fee.